I visited my dad on Saturday. As you know, he lives on The Sun, and The Sun doesn't generally have very good things to eat. But Papa Monkey took me to a place with yummies this time! 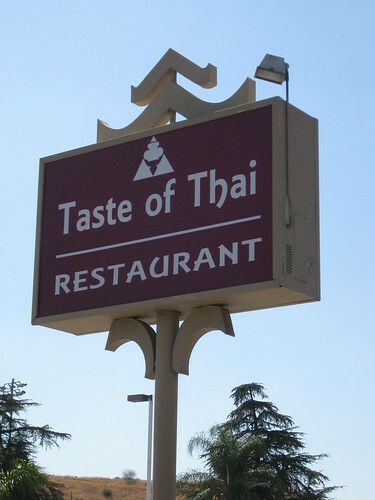 Taste of Thai (1180 E. Highland Ave., San Bernardino) is the kind of place you'd drive right by. It could be a dry cleaner. It could be a nail salon. It is that generic a space. Maybe my expectations were low, but I really liked our meal. 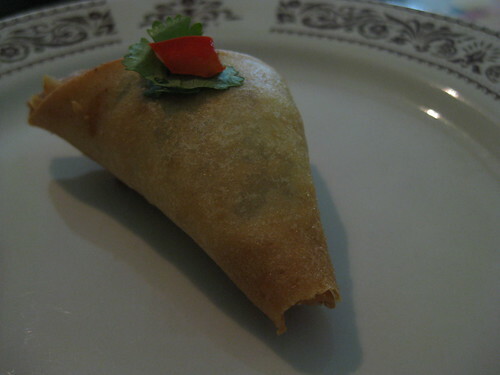 We started with Golden Triangles ($5.95), curry puffs filled with minced chicken, potatoes, peas, and carrots served with sweet and sour sauce. So. Damn. Good. I could eat 20 of these. 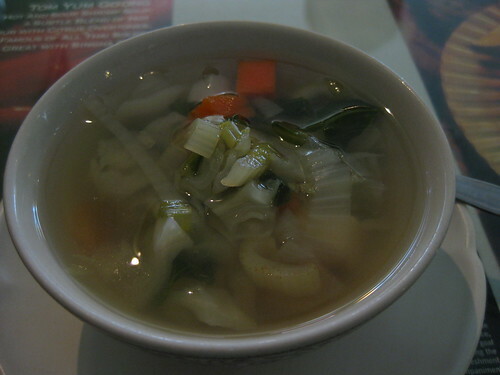 Our meals came with a pleasant vegetable and tofu soup. 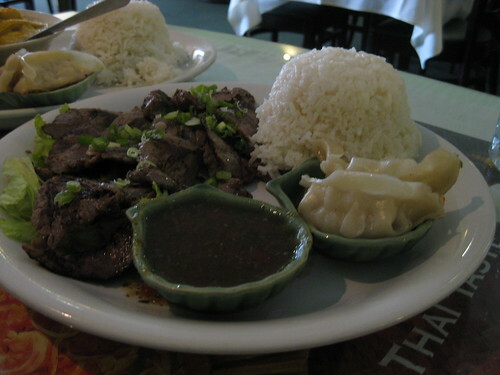 The Crying Tiger ($7.95), sliced grilled flank steak with fresh chile and lime sauce, was tender and flavorful. The tang of the sauce complemented the lightly charred beef well. 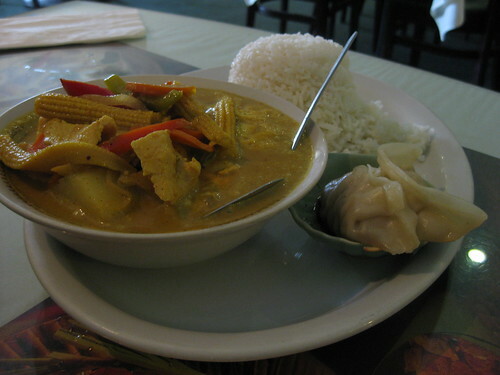 The yellow curry chicken ($5.95) had a mild kick and was steeped with coconut milk, potatoes, carrots, onions, peppers, and tomatoes. The curry was so good that my dad had the sauce packed up even though we ate all the chicken and veggies. The dumplings that accompanied the lunch specials were also lovely. 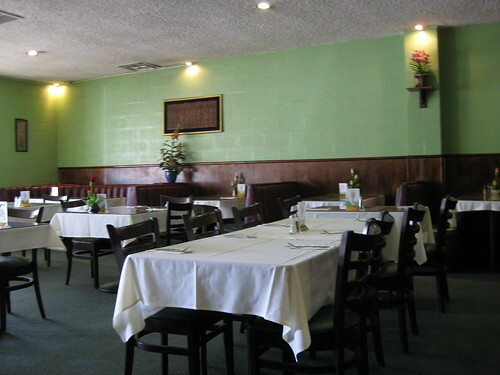 Thumbs up for this little Inland Empire eatery. I'm a big fan of Thai food . . . it's usually good and always cheap (in LA). the inside looks clean? now I'm hungry (shocker). 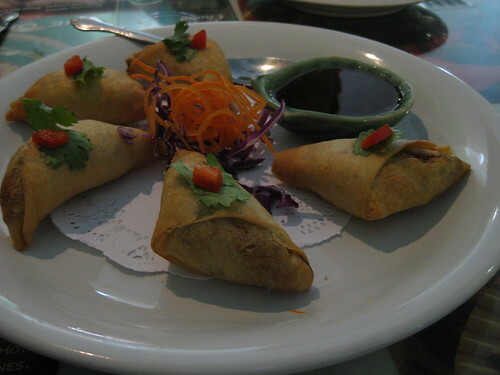 I started going to Taste of Thai when it first opened and I was working nearby. Heading back there for lunches is one of the few positive things about my upcoming reassignment. Sounds great. I haven't had Thai food in forever. crying tiger is yummy. mmm. that all sounds fabulous - especially the steak!